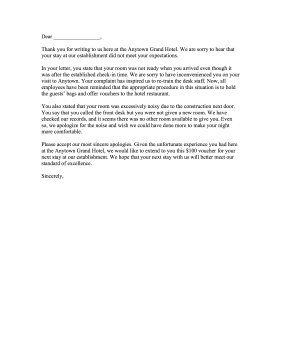 Hotel managers and service providers can use this adjustment letter to fix customer complaints. Thank you for writing to us here at the Anytown Grand Hotel. We are sorry to hear that your stay at our establishment did not meet your expectations. In your letter, you state that your room was not ready when you arrived even though it was after the established check-in time. We are sorry to have inconvenienced you on your visit to Anytown. Your complaint has inspired us to re-train the desk staff. Now, all employees have been reminded that the appropriate procedure in this situation is to hold the guests' bags and offer vouchers to the hotel restaurant. You also stated that your room was excessively noisy due to the construction next door. You say that you called the front desk but you were not given a new room. We have checked our records, and it seems there was no other room available to give you. Even so, we apologize for the noise and wish we could have done more to make your night more comfortable. Please accept our most sincere apologies. Given the unfortunate experience you had here at the Anytown Grand Hotel, we would like to extend to you this $100 voucher for your next stay at our establishment. We hope that your next stay with us will better meet our standard of excellence.